In our third blog post exploring findings from Wine Lister’s recently released Bordeaux Market Study, we look at the top scoring Bordeaux crus as at 28th April 2017. These are the overall Wine Lister scores comprising the three category scores for Quality, Brand, and Economics. They are applied at wine level (an average of the last 30 vintages, with the highest weighting for the most recent vintage – 2016 – and so on). Nine of the top 25 are from the right bank, and 16 from the left bank. As in last year’s study, the top eight spots are occupied by the five left bank first growths, as well as Petrus, Yquem, and Cheval Blanc, but with a significant reshuffle among these wines. Mouton gains 18 points and climbs two spots to join Petrus at the top of the table this year. 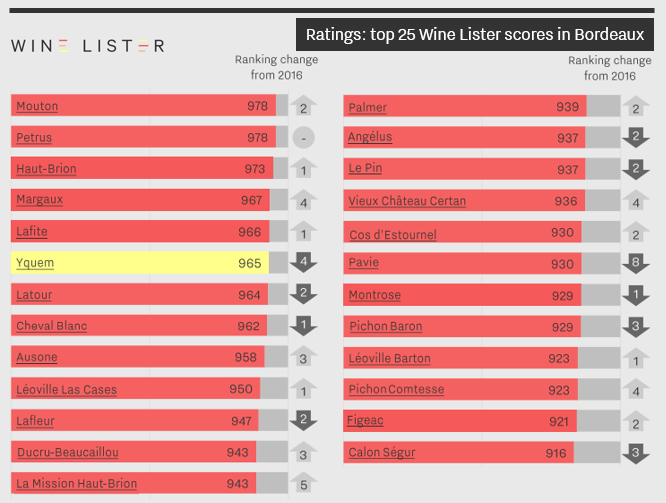 Haut-Brion comes third, one position higher than in 2016. Next come Margaux and Lafite, separated by just one point, although Margaux has surged up the ranking this year, gaining four places. Yquem, the only white wine in the top 25, drops four places this year, while Latour and Cheval Blanc are also down on last year’s positioning. Ausone comes ninth, up three places from last year, and Léoville Las Cases rounds out the top 10 as the highest placed deuxième cru. The two newer Saint-Emilion premiers grands crus classés A also feature in the top 25, although Angélus and Pavie have dropped two and eight spots respectively since 2016. Meanwhile Pichon Comtesse and Figeac make their debut into the top 25 this year. This is just a taster of the Bordeaux Market Study, but you can download the full 48-page report from the Wine Lister Analysis page (subscribers only).